SHADOW Scottish Secretary Margaret Curran has said that women would “lose out” and have to “suffer” the worst effects of the SNP’s plan for full fiscal autonomy. Ms Curran made the claim as Scottish Labour launched its women’s manifesto, which includes pledges to increase the minimum wage to over £8 an hour and to guarantee a paid job to every 18-24 year old woman out of work for more than a year. 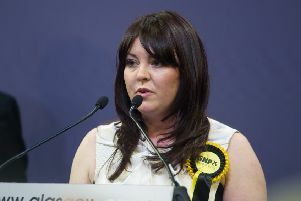 The shadow minister, who is Labour candidate in Glasgow East, restated her party’s claim that the SNP’s plan for full fiscal autonomy would lead to “years of cuts”. Ms Curran said: “When times are tough, it’s always the women who lose out. And when the money we have to spend on things like tax credits and our NHS gets slashed under the SNP’s plans for full fiscal autonomy, it will be the women of Scotland who will suffer. “Working class women in Scotland face a choice: a better future and a better plan with Labour of years of cuts with the SNP.